Information is the lifeblood of your campus. Ellucian IT solution can help you connect that information, make it easy to access and use, and protect it from potential attacks. It’s what we do. Data breaches are more sophisticated, frequent, and devastating than ever. Rather than spend precious resources undoing damage to your assets and your reputation, implement a comprehensive database security solution that thwarts attacks in the first place. Encryption package encodes data in transit and at rest to prevent unauthorized access to information. Secures, shares, and manages keys across the institution. Manages key lifecycle stages including creation, rotation, and expiration. Seamlessly enrolls and provisions server endpoints. Centralizes keys in a modern, secure, and robust key management platform. Audit tool provides alerts and reports that help you craft gold-standard policies across all databases. Consolidates audit data and logs generated by databases, operating systems, directories, file systems, and custom sources into a secure centralized repository. Provides enterprise security intelligence and efficient-compliance reporting by combining, monitoring, and reporting data. Tracks all database changes, server errors, and user activity. Database firewall monitors for malicious intent and provides the first line of defense against database-specific attacks and SQL injections. Accurately detects and blocks unauthorized database activity including SQL injection attacks by monitoring traffic to Oracle® and non-Oracle databases. Utilizes a unique SQL grammar-analysis engine and easy-to-define whitelists and blacklists to ensure high accuracy and performance. Delivers horizontal and vertical scalability through easy-to-deploy “software appliances”. Expert implementation keeps your security strategy evolving along with software, as well as critical systems running at top performance. Provides best-practice security guidelines to help you correctly configure this powerful set of defense-in-depth solutions. 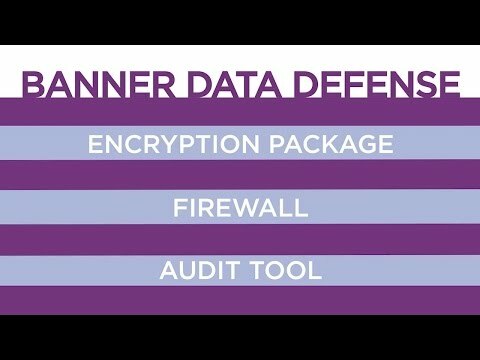 Delivers tightly aligned configuration and security based on Ellucian’s knowledge of Banner architecture. Ensures accuracy—our experts have years of experience testing performance and ensuring quality while working with both Banner® by Ellucian and Oracle® databases. Automatic data capture eliminates manual data entry and improves transactional efficiencies by capturing files from anywhere, including mobile devices. Capture documents on demand from virtually any device in any location. Apply bar codes, patch codes, optical character recognition, and intelligent character recognition. Automatically relate content to specific screens or transactions within Banner® by Ellucian. Use unlimited metadata options to index content with unique characteristics or requirements. Document management increases efficiencies and ensures compliance with institutional policies. Enable users to digitally sign documents, check out the latest version of a document, check in a new version, and review a history of revisions. Organize all institutional information in a secure, central, electronic repository. Grant or revoke individual and group rights to each distinct system function. Conceal confidential data while preserving a document’s original integrity. Workflow designer streamlines processes and document approvals throughout your institution. Create, manage, and modify simple and complex workflow processes using the intuitive workflow interface. Build powerful document routing rules using ordinary language. Automatically direct documents to work queues based on linear or parallel processes; specific data inside documents, e-forms or databases; and other methods. Simplify processes with customizable, real-time notifications and integrated to-do lists that establish deadlines and priorities. Electronic forms and signatures capture data directly and replace paper forms. Collect raw data from web pages, mobile devices, and software applications. Validate, store, organize, and secure content collected in eForms so you can route it through workflows and apply version control. Enable users, including students, to submit forms and data via your portal. Convert paper forms into electronic replicas, with original structure intact. Distribute documents securely with options for parallel or sequential signing by internal staff. Records and information management allow you to manage the complete lifecycle of content, from capture and retention to archiving and destruction. Archive or delete content based on your business rules and retention policies. Define phases and triggers within time- and event-based document retention policies. Manage data as needed—destroy it, transfer it to storage (online, nearline, or offline), or permanently retain it. Easily create holds to prevent the modification or deletion of information.